Marc Tessier-Lavigne, president of The Rockefeller University, today announced two leadership pledges of $75 million each from the Stavros Niarchos Foundation and David Rockefeller to launch a major extension of the University’s campus on the East River. 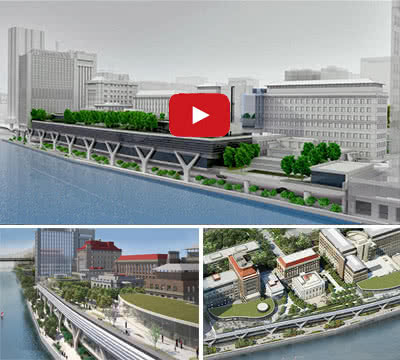 Designed by Rafael Viñoly Architects, the project will add two acres to the existing 14 acres of the campus by building over the FDR East River Drive, enabling the creation of several new buildings with state-of-the-art laboratories, administrative space, a conference facility, a dining commons, and an outdoor amphitheater. The new campus will renew the University’s laboratory stock, foster greater scientific collaboration both within and beyond the University, and provide new venues for public programs to advance the dissemination of science to a broader audience. As part of the project, the University will also improve and beautify the public esplanade adjacent to the campus for the benefit of the greater New York City community, and make major repairs to the seawall along the river. In addition to thanking these two philanthropic pioneers, Dr. Tessier-Lavigne also acknowledged a number of New York City leaders, including Manhattan Borough President Gale A. Brewer, former Mayor Michael Bloomberg, and Mayor Bill de Blasio. The Stavros Niarchos Foundation is one of the world’s leading private international philanthropic organizations, making grants in the areas of arts and culture, education, health and sports, and social welfare. The Foundation funds organizations and projects that are expected to achieve a broad, lasting and positive impact for society at large, and exhibit strong leadership and sound management. The Foundation also seeks actively to support projects that facilitate the formation of public-private partnerships as an effective means for serving public welfare. From 1996 until today, the Stavros Niarchos Foundation has made grant commitments of $1.49 billion / €1.13 billion, through 2,809 grants to nonprofit organizations in 111 nations around the world. In 2012 and 2013, the Foundation announced two new initiatives of €100,000,000 ($130 million) each, to help the efforts to address the crisis in Greece. While the initiative in 2012, which has been completed, aimed to provide immediate relief against the adverse effects of the deepening crisis, the one in 2013 aims to address the high percentage of youth unemployment, seeking to create better employment prospects and new opportunities for the young. The Foundation’s largest single gift ($796 million / €566 million) is the Stavros Niarchos Foundation Cultural Center (SNFCC), in Athens, which is expected to be completed in 2016. The project, designed by Renzo Piano, includes the new facilities of the National Library of Greece, and of the Greek National Opera, as well as the Stavros Niarchos Park. The SNFCC is a testament and a commitment to the country’s future. It is also an engine of short- to mid-term economic stimulus. David Rockefeller retired as Chairman of the Chase Manhattan Bank in 1981, and served as a member of the International Council of JP Morgan until August 2005. Mr. Rockefeller served as Chairman of the Rockefeller Group, Inc., from 1981 to 1995, and as Chairman of Rockefeller Center Properties, Inc. Trust, from 1996 to April 2001. Mr. Rockefeller has wide-ranging interests and involvement in the fields of international relations and civic affairs. He served as Chairman of the Council on Foreign Relations from 1970 to 1985 and now chairs its International Advisory Board. He was instrumental in creating the International Executive Service Corps, a nonprofit organization that sent volunteer experts to developing nations to provide technical and managerial assistance to private enterprise. He helped to found the Trilateral Commission in 1973 and in 1991 stepped down as its North American Chairman, now serving as Honorary Chairman. In 1979, he co-founded the New York City Partnership, which is dedicated to economic development and effective governance in New York City through private-public partnerships. He is Honorary Chairman of the Americas Society and its affiliate, the Council of the Americas, an organization which he founded to promote closer inter-American cooperation, both on a business and cultural level, as well as better communication between the public and private sectors. He served as Chairman from 1981 through 1992. Mr. Rockefeller is the former Chairman of The Museum of Modern Art and continues as Chairman Emeritus and Life Trustee. Mr. Rockefeller served as Chairman of The Rockefeller University for many years and is now Honorary Chairman, a Life Trustee, and Chairman Emeritus of the Rockefeller University Council. He has also been President of the Harvard College Board of Overseers.